Waving the inevitable goodbye to Georgia peach season. Something that once hovered far away in the distance, is now upon us. I’ve spent a ridiculous amount of time freezing peaches in the name of peach cobbler, tarts and jam for biscuits.. There is still time to revel in the juicy sweetness of a ripe peach or better yet slice them up while dressing them in a bath of honey and molasses. It's a nostalgic recipe as that is clearly what I do best. My memories of sliced peaches and molasses are never ending, as are the ones filled with summer rays and fruit flies. Sitting outside on a brick stoop, we'd watch the cars ride by as molasses dripped down the side our hands. No napkin in sight. However a slice of Sunbeam bread did the trick. My grandma would lean over, with the North Carolina sun shining through her gray hair and say.. "who in their right mind would eat peaches and sliced bread"
For these tarts I traded the sliced white bread for Pate Brisee, however the molasses and honey treatment of these peaches is very much the same as it was those summer days so long ago. For the crust Thomas Keller's Pate Brisee is a solid recipe that I turn to for all of my tart crust. The Crust is Thomas Kellers Pate Brisee that I modified slightly for the individual tarts. For the tart dough: Mix 1 cup of the all purpose flour with the salt in the bowl of a stand mixer. While mixer is still running add in the butter small pieces at a time. Once butter is added increase the speed to medium and mix until the butter is blended. Add the remaining 1 cup + 3 tablespoons of all purpose flour mix to combine. Be sure to scrap down the sides of the mixing bowl to make sure all the ingredients are incorporated. Add the water and mix until blended. The dough should feel smooth. Make sure all the butter is blended before removing from the mixer. Pat the dough into a 7 to 8 in disk, cover with plastic wrap and refrigerate over night. Roll out the dough to an 11 x 16 inch rectangle about ¼ inch thick. Cut 6 -5 in circles. Place the circle in the tart rings. Place on a large baking sheet and put in the freezer for 10 minutes. Meanwhile, in a small bowl mix together the 3 tablespoon of flour and 2 tablespoons of sugar. 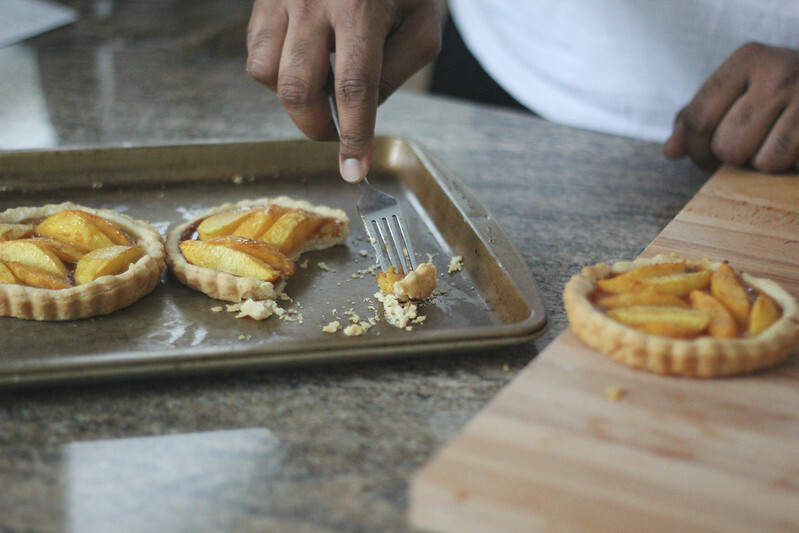 Remove tart crust from the freezer and sprinkle the flour/sugar mixture in the bottoms of each tart. 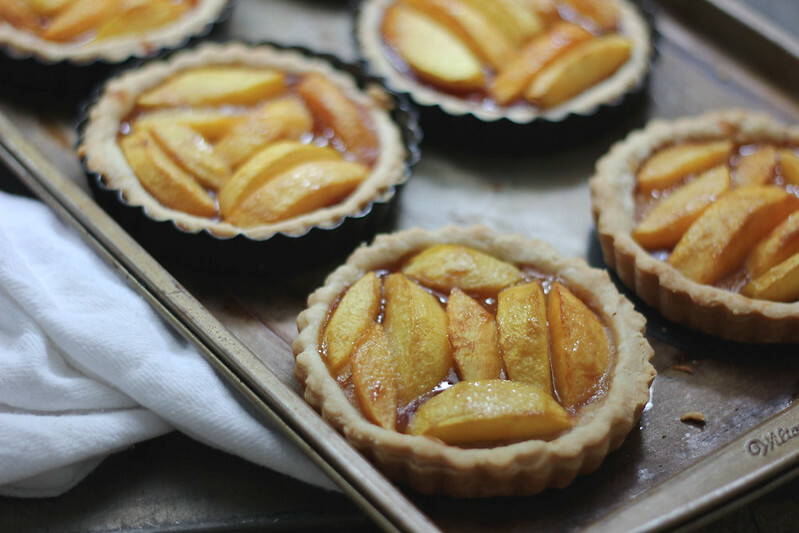 Arrange peach slices in each tart, drizzling the molasses and honey over each one. Brush the edges of the crust with the melted butter. 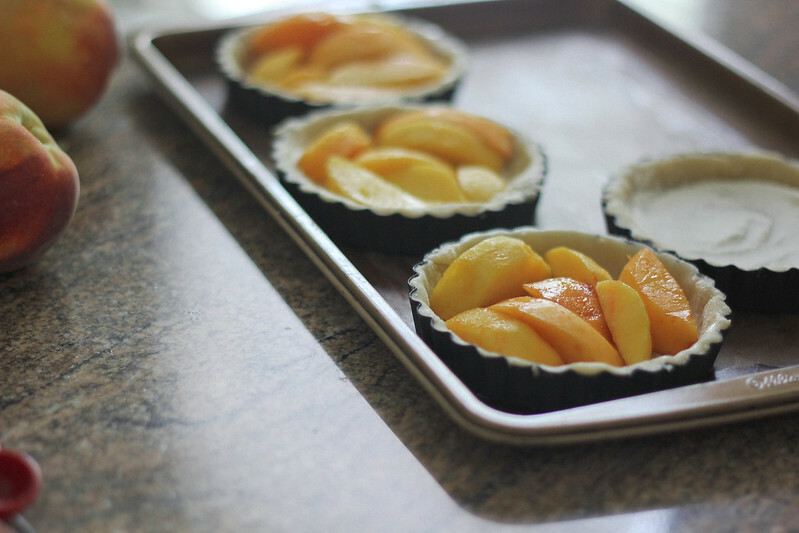 Place tarts (still on baking sheet) in the oven and bake at 350 for about 35 minutes or until crust is golden brown. 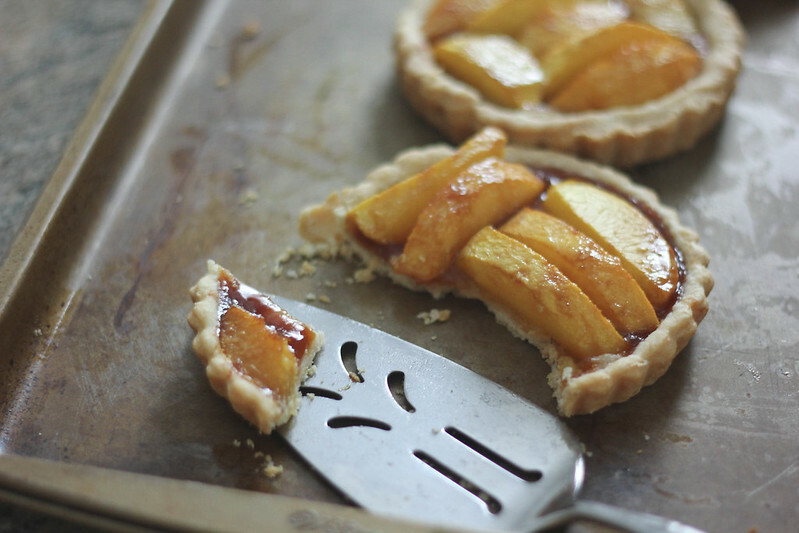 Allow tarts to cool slightly before eat. Low Country Boil + A little time in Beaufort….